Stinging Nettle plant, Urtica dioica, is also known as Greater Nettle and Nettle. Best herbal source of nutrition. Delicious and valuable as cleanser and spring tonic. Leaves can be cooked like spinach and added to stews. Cooking or infusion removes the “sting” from the nettle. The roots are approved by German Commission E as a remedy for prostate problems. A blood, liver and diuretic kidney tonic. A cold infusion of the leaves is used as a garden fertiliser and spray for aphids and also as a hair conditioner to control dandruff. Improve the mineral content of compost by adding nettle leaves. 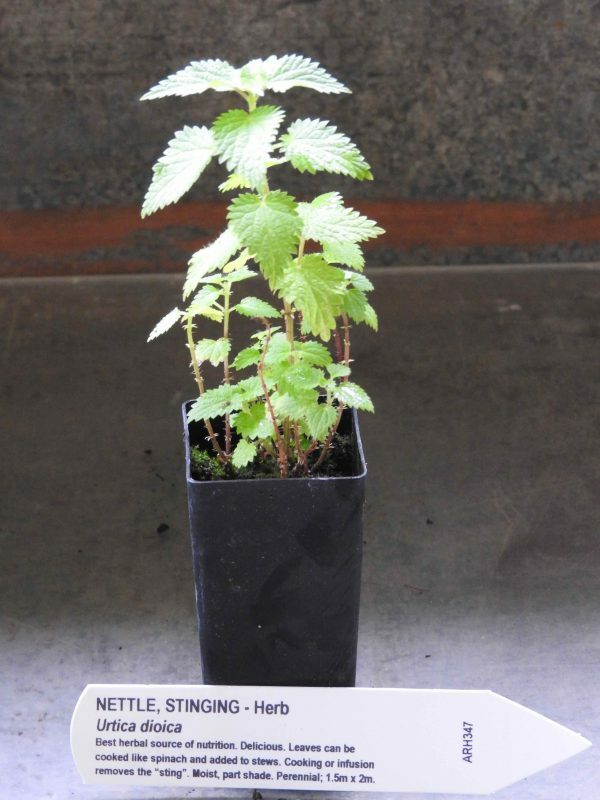 Note: This is not the native stinging nettle (Urtica incisa) found growing in moist, protected positions. Stinging Nettle plant is a native of temperate regions of Europe and Asia and is adaptable to most soils and positions. Flowers in summer and autumn. Drought and frost resistant. A perennial plant, growing to a height of 2.5m x 2m. Be the first to review “Nettle, Stinging plant” Click here to cancel reply.